Exercising the Right Way: Do Children Know Best? As fitness and exercise specialists, we want to do what is best for our bodies not not only get in “shape” for now, but to exercise for life and longevity. It is often said that we can learn a lot from our children. So what can we learn from them when it comes to working out? 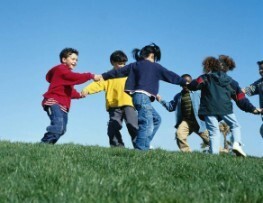 When I watch my kids playing just for fun, it seems like they can run forever. But when they get tired or stub their toe, what do they do? They stop. They rest. They have mommy or daddy hold them until the pain goes away. Now take the other end of the spectrum. Organized youth sports. When little Johnny gets tired and his muscles are telling him to stop, what is he often told? Don’t stop, you have to finish. It builds character, right? Well in some ways, yes. When it comes to a job or getting a paper done for school, sometimes you need to push through when you want to stop. But does it really apply to exercise? Exercise and sport are two very different things. Quitting in a competitive sport is not something our culture encourages. But what about when you are running and your foot tells you to stop? What if your shoulder huts while lifting weights? No pain, no gain, right? Why do many people stop exercising? One reason obviously is that it can be hard. But does it have to be that hard? Another thing kids teach us about is micro-progression. Kids progress slowly – crawl before you walk. With exercise we tend to go to extremes. We do nothing for months or years and then we try to go all out to get back in shape. Many people quit because they do too much too soon and then they get frustrated and/or injured. The bottom line, for long term health, exercise is essential So get out there and get active. Move your body but listen to it as well! Stay active and progress slowly. If you listen to what your body is telling you, then positive things will happen. If you are young and active now, keep it up but realize your limits. When something hurts, stop. Try again in a day or two. Try a different exercise or modify the exercise as needed. Realize that all of us were created unique so what works for one may not work for someone else. If you like sports and need that competition, great. Just understand the risk versus the reward of your particular sport. If you want to feel like a kid again, exercise like one and listen to your body.